For many, the lakes in Kosciusko County, Ind., are more than scattered bodies of water. Taken together, the lakes’ cool depths, sky-reflective faces, and potential for water sports are family heirlooms. Local community members like Erin Williams are deeply invested in the future of the lakes. The Lilly Center for Lakes and Streams is equally invested in the health of the local lakes and streams. 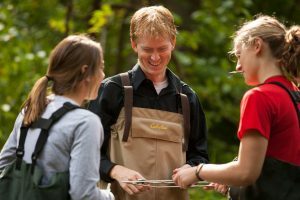 The team of seven, with the help of 18 student interns from Grace College, Winona Lake, Ind., work tirelessly to conduct scientific experiments, educate the community, and share relevant lake and stream data. With more than 100 lakes in the county, local water resources are a key economic driver in its communities. In 2016, the Lilly Center completed a study on the economic value of the lakes: approximately $313 million annually. Through year-round lake and stream sampling, among many other efforts, the Lilly Center seeks ways boost the economic value and fuel personal investment in the lakes. Scientific research is especially important for the future. With a wealth of past and present data, Kosciusko County can monitor how the lakes change over several years. Patterns are noted; the positive and negative impact of choices regarding the lakes are revealed. Another way the Lilly Center prepares for the future is through a partnership with the environmental science program at Grace College. The program seeks to train young professionals who will approach creation care with a mindset of stewardship and service. The students burn prairies, get muddy in marshes, taste tree bark, splash in streams, discuss current issues, and develop a biblical understanding of Creation. Paired with the Lilly Center’s work, the students stay on the cutting edge of scientific research. Results of the Lilly Center’s work are varied, revealing problems and solutions in equal measure. For instance, in the summer, excess weeds and algae are often visible. The Lilly Center keeps a careful watch on the nutrients in the lakes by regularly collecting data. Over the years, the team has identified which nutrients cause the overzealous growth of underwater plants. Thanks to their research, it is evident which forms of nutrients are most useful for weeds and algae, as well as where the nutrients originate. Like Twinkies for algae, some forms of nutrients cause rapid, unwanted growth. Although lake science rarely provides quick, simple solutions, it helps pinpoint patterns that effect the lakes. For locals like Erin, better lakes start at home. Among other actions, Erin avoids using fertilizer and supports local lake associations like the Lilly Center. Editor’s Note: Abby Phinney is a communication specialist at the Lilly Center for Lakes and Streams, Grace College, Winona Lake, Ind. For more information on the Lilly Center, see lakes.grace.edu. This was first published in GraceConnect magazine. To read the complete issue online, click here. To receive your personal copy, at no charge, in the mail, click here.